eGPU is on top of shelf just next to my desk. 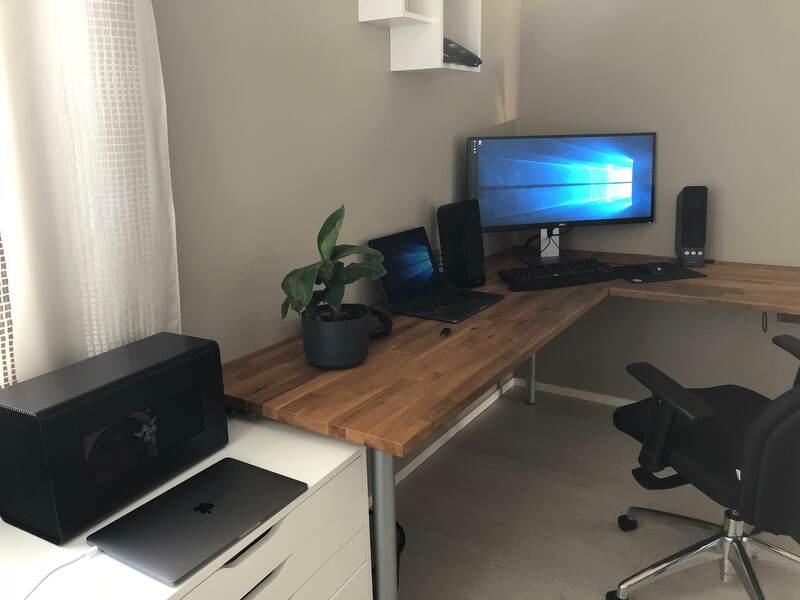 13 inch MBP is my wifes, and she is using it with eGPU on MacOS only when some heavy text editing is needed so there is no interesting story about it. Just plug'n'play. I use my external display at the corner, so I can stretch my legs when playing around with computer. I use TB3 ports near the display. 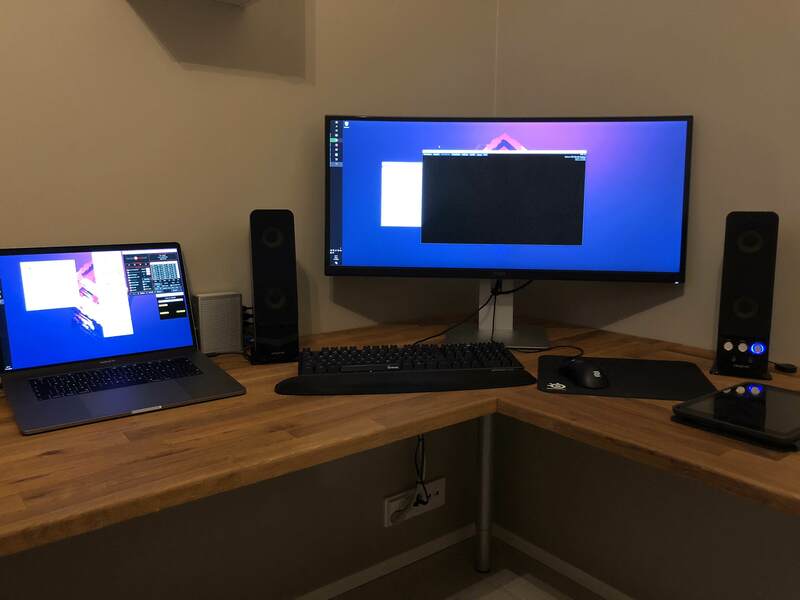 eGPU is on the left, TB3 dock is on the right. 1. eGPU accelerated external display. 2. dGPU accelerated internal display. 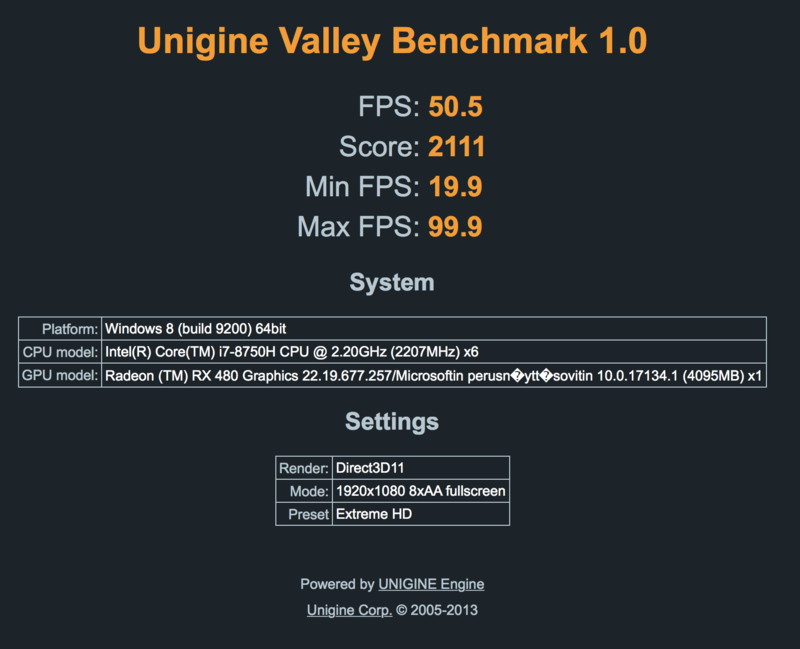 - Because we use no drivers for dGPU, 3d acceleration is abysmal. - 2d acceleration is fine. Desktop -like applications are fine. 4. Only temporary T2 security chip-disable is needed. 1. Install Windows 10 1803 with Boot Camp Assistant. 2. Install all of the drivers included in Apple driver setup -program which pops up after the first boot. Update all of the Windows updates. Reboot if asked to. 3. Uninstall AMD Program which came with Boot Camp driver -package. Reboot if asked to. - Make sure to NOT INSTALL any AMD drivers through Windows Update after this part. - Push CTRL + R during boot up. 5. Use Startup Security Utility to set Secure Boot to No Security and External Boot to Allow booting from external media. 6. Boot into Windows through Apple_set_os.efi. - Basically you enable iGPU in Windows with this .efi. - Push option -key to see boot options. 7. Disable internal dedicated GPU -adapter in device manager. - Disable it in PCI lane side. 8. Reboot to Windows through apple_set_os.efi with eGPU plugged in. - Easist way is to shut down the device, plug eGPU in and boot. 9. Install the latest AMD drivers from the AMD home page. - Sometimes AMD driver -package does not detect the eGPU properly and fails with a message along the lines of "no AMD adapter detected". Try to reboot, try to move eGPU TB3 plug around ( during shutdown ) to avoid. - You should get a picture to the external screen at this point. 10. Reboot normally to Windows, with no modifiers. - No apple_set_os.efi / iGPU. - You lose internal screen until next step. Login window should appear on external screen after a little bit of waiting. - Do this after you've got picture in external screen. - If you have problems, like black screen after enable, boot without a eGPU and see what drivers Windows uses for dGPU. It should use the most basic ones, adapter should be shown as "basic display adapter" in Windows device manager. HWinfo detects adapter as generic "AMD". - After this step you can Windows + P -> extend displays to get image to the internal screen again. - It seems like I lose extended display mode from time to time for some reason. Windows + P after the login makes it come back. Heaven @ Windows, extended display running, benchmark in fullscreen mode @ external display. Valley @ Windows, extended display running, benchmark in fullscreen mode @ external display. Valley @ MacOS, extended display running, benchmark in fullscreen mode @ external display. Superposition @ Windows, extended display running, benchmark in fullscreen mode @ external display. My primary goal is to use my eGPU to the fullest potential. To maximise TB3 bandwidth available I use dual TB3 cable system with eGPU enclosure and CalDigits TB3 dock. I also want to use the latest drivers available for the best performance. 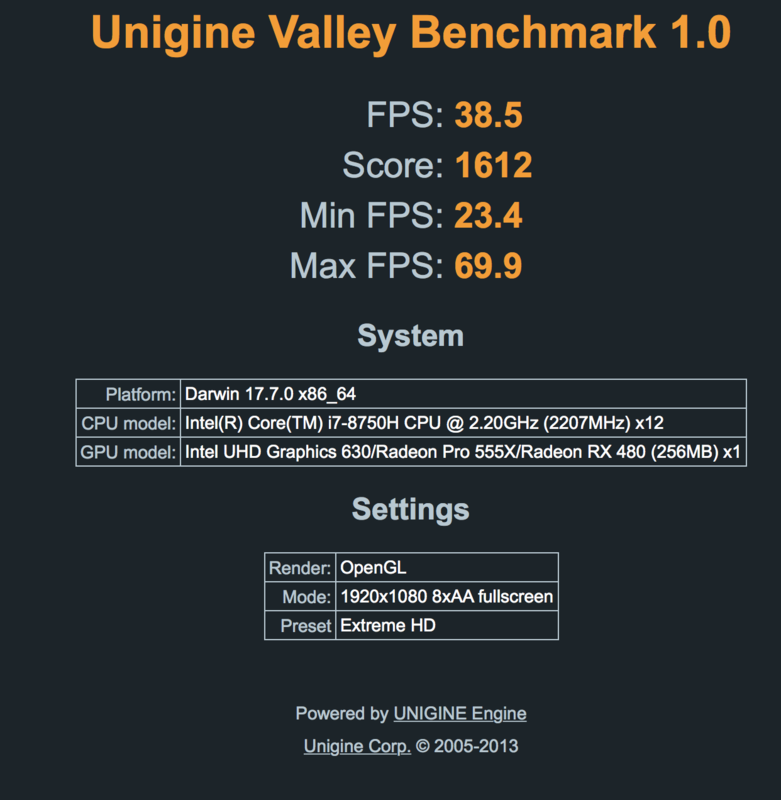 My secondary goal is to be able to easily use my MBP as a mobile gaming platform with dGPU. I never experienced any error 12s. I did not disable anything besides display driver/dGPU from device manager temporarily for AMD driver installation. Apples latest throttling update doesn't seem to fix Windows side, so I fixed throttling with setting custom power limits with ThrottleStop. Now I am getting 3.9ghz boosting with all 6 cores all the time on Fortnite and pretty okay results with CineBench and other synthetic tests without any thermal throttling. Earlier I got extreme throttling all the time because temps were going well over 100c. Right now my temps hover around 80-90 when gaming and 90-95 when BenchMarking. It took some retries and reboots for AMD driver package to notice the enclosures GPU for a some reason. Even though device manager showed RX480 just fine, drivers stopped installation with error about no AMD GPU detected. CPU-Z/GPU-Z detected also exactly which GPU was inside the enclosure. Both of the displays, internal and external, work just fine. It seems like Windows doesn't care if display adapter is disabled or not. If you don't want GPU to work, you have to disable it on PCI-lane side. 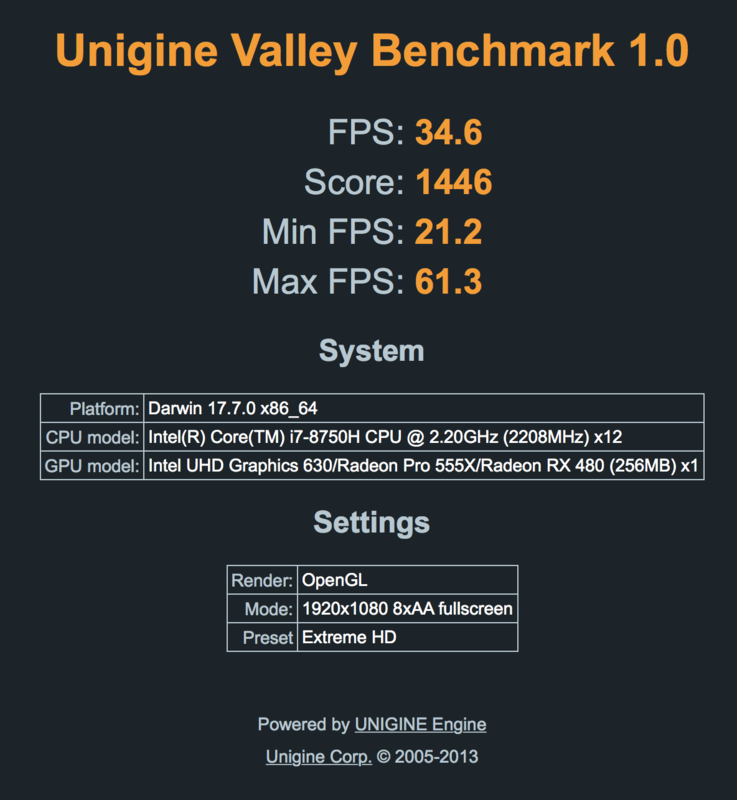 In my case and according to my tests, internal screen is accelerated with dGPU, which is the optimal solution for me. 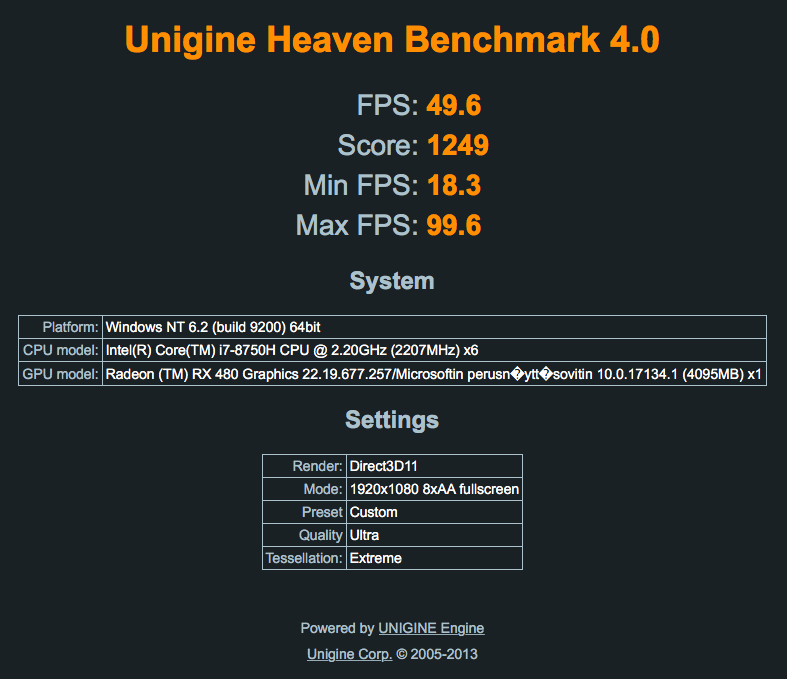 Performance for the internal display is abysmal though, because there is basically no proper drivers. Accelerating heavy 3d stuff causes heavy throttling on CPU, a secondary ThrottleStop profile is needed for the mobile dGPU gaming solution. RP555X is detected as "Basic Display Adapter" and it is using basic Windows drivers from 2006. I was able to achieve my secondary goal by installing RP555X drivers from the BootCamp setup-packages .inf files every time I want to use the laptop mobile. When I reboot with eGPU, Windows disables the dGPU automatically because of some errors on RP555x, and I can just remove the drivers to refert back to the old situation. I'll use mobile gaming like 4 times a year, so this is good enough for me and way better than losing some security. 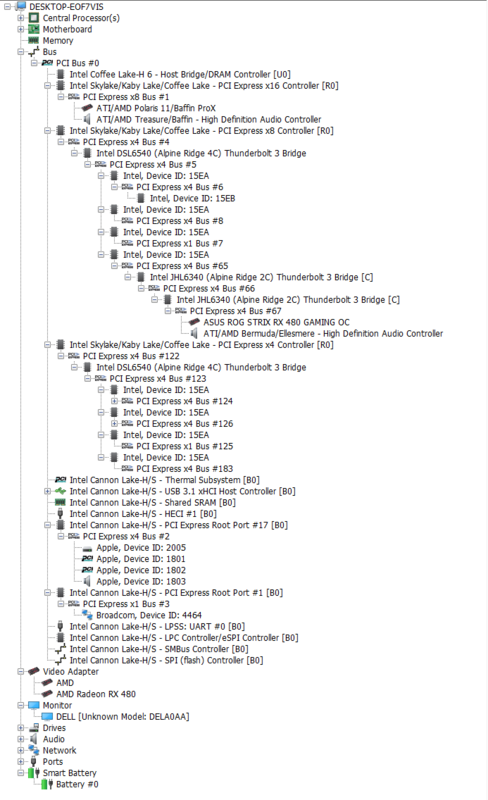 PCI -lanes + display adapters in picture. dGPU is using Basic Windows Display Adapter -drivers. 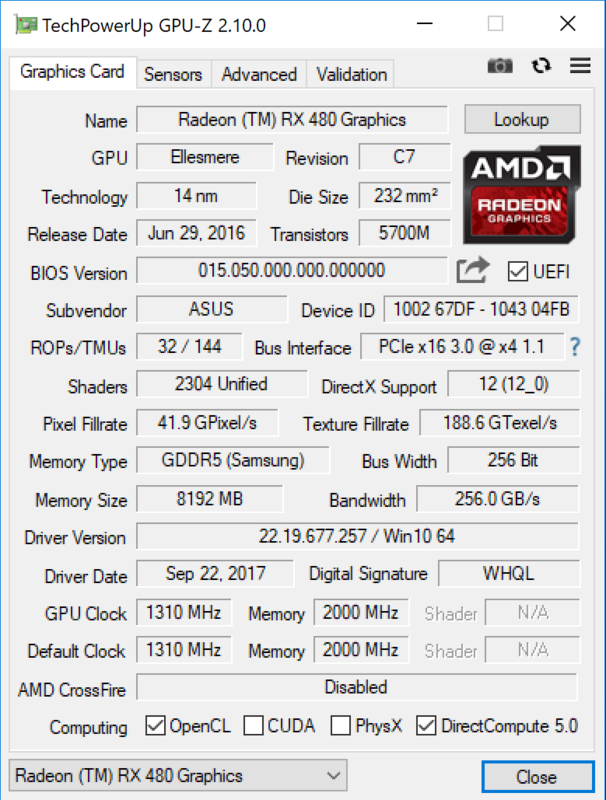 GPU-Z detects RX480 just fine. GPU-Z fails to detect most of the stuff for the RP555X. This might also be because of GPU-Z unsupporing RP555x at the moment, but bad drivers are also a reason. Thanks for sharing! Can you provide more information on your ThrottleStop settings? I tried to use it before but I messed up and gave up haha. I can’t seem to get apple.set.os.efi to boot without a garbled black screen with pulsating white dot grids on my screen eventually fading to black. if I uninstall the int drivers, I can boot with the internal display working unacellerated and egpu acellerated on an external monitor. I want the reverse as you. I would love to have the internal display working and acellerated while traveling. I have rEFInd installed with the latest version. Upon boot, I hit the set.os option then select windows. 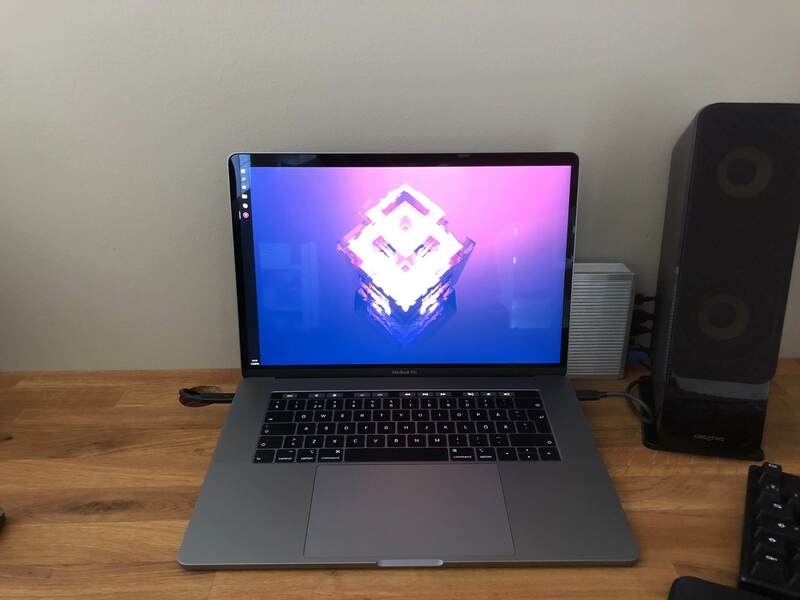 2018 15” MBP 2.6/512/16GB with Razer Core v2 1080ti FE. If anyone can help I would extremely appreciate it. Per instructions, run integrated.bat prior to booting via apple_set_os.efi. I run intergrated.bat with admin settings and reboot. Then, with the rEFInd up, I select the set_apple_os option then select windows. It starts to boot, but then I have the issue with the internal screen flashing with white dots and goes to black. I updated this guide quite a lot. My first presumption about eGPU accelerated internal display proved to be false. My workaround at first was to disable just the display adapter in Windows, but Windows seems to like re-enable it on reboot, which I did not notice at first. I'd like to hear other stories about mid 2018 15 inch MBPs. I am pretty sure that right now that iGPU part might be unnecessary for startup period. The most important point is to make eGPU to be detected properly, so xConnect starts up properly. We might even have a almost plug'n'play solution for AMD eGPUs @ bootcamp, if some reboots are not counted. I could not get voltage offset to work, so I did not include the picture from there. Package Power Long seems to work, after a while package power usage throttles to 40w and PL1 triggers on Limits -window. Package Power Short doesn't seem to work. Power usage may peak to even around 100w, even when 55w is set here. Also the option to tick PPS is greyed out. PP0 current limit is the main factor for keeping heavy PROCHOT/ emergency thermal throttling triggering out of question. I found out that 100 ( mAs? As? IDK ) is just barely fine for most of the stuff. I get some light thermal throttling at benchmarks with 100, but also more steady clock speeds when playing around in normal life situations. Lower amounts make also benchmarks to be as low temps as you want to, but of course in expense of short term peak performance. EDP other is the Limit Reason for PP0 current limit. I don't know if PP0 power limit works. I'm investigating this question. Thanks for replying! I'll definitely take a look at this when I got mine! I was literally searching all over the internet for this setup. 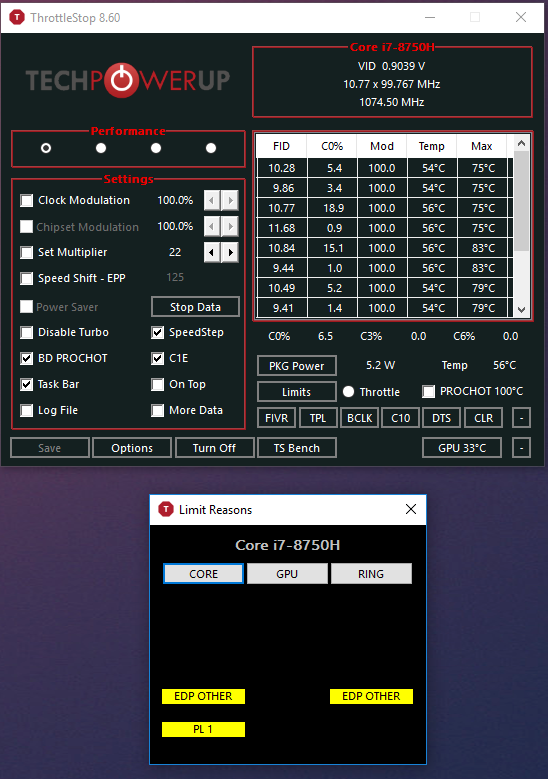 My main question is, can you try to benchmark it the way it is now and then try to benchmark it with the Razer Core connected to the extra TB3 slot on the TS3 Plus Dock? I reallllly want that 1-cable life but I also want an eGPU, so I'm trying to weigh my options. TS3 support told me to expect a degradation in quality, but I don't know by how much? I also want to run 2 4K on the eGPU, so I'm already pushing it, so I want to make sure it all works before I burn $1k+. I did some fast testing. In Windows your suggested setup with MBP <-> TS3 plus <-> Razer Core X sent the display adapter to a error mode. Because I did not want mess my now working setup, I stopped right here. I'd say that the cabling setup would work with some troubleshooting. In MacOS your suggestion worked just fine, plug'n'play. I ran Valley, and results are below. It seems like in this particular test we got a performance degradation of about 10-15%. 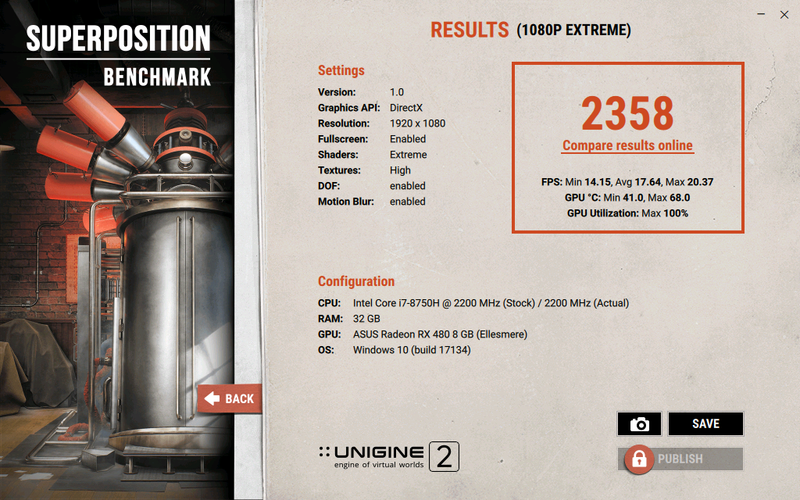 My earlier benchmark with TB3 -cable directly connected to the eGPU is in my original post. I'd say that you should expect more performance degradation from more powerful cards or higher bandwith/FPS situations. riiippp. Well.. another question while I'm here then. If I connect two 4K monitor vs 2 1440p monitors to the eGPU, then connect to the Mac, would the CPU usage be significantly different between the two? I am considering getting the eGPU to help with games like Civ 6 but 1) I don't even know if eGPU will help since laptop CPU might be bottleneck and 2) does the quality and quantity of monitors attached also lead to FPS loss on the games and general system performance? @realistic, which version of this monitor did you get? I saw there was two with two different curves. Also, is there a reason you chose this over 2 monitors? Is it just me or is that degradation wayyy less than expected? I mean a 10-15% hit for the convenience doesn't seem too bad. But I mean if it doesn't work on Windows then that might be a problem. Thanks for the quick tests OP! The higher the resolution, the more on par and less degradation you will see when comparing setups. That’s what kills me with all these YouTube videos is that they never push it to 4K and show the difference when compared to another system. At 1080p, There is a wider margin of loss when compared to other systems. I became a little bit interested in this TB3 daisy chaining question. I think that I'll reproduce all of the tests with 3440x1440 in Windows today, if it doesn't take too much time to get system working. edit: It seems like I get the infamous error 12 with the daisy chaining setup. I tried to disable pretty much everything, even with iGPU running, but it did not disappear. I might investigate more, or I might not. I don't know if I've got the time. I tested Civ 6 just moments ago with my wifes 13" 2017 MBP and a eGPU, just before removing bootcamp. I saw exactly the same FPS as my 15" 2018 MBP with exactly the same settings at very late game situation, where there is a lot to render. I'd say that the game is GPU bound in late game situations. I tried it also with RP555x in Windows, and there I hovered in around 15-20fps in native resolution of the internal screen in the same busy area in my save. On the CPU side more cores seems to shave turn processing times a little bit, which is good. This display is already like 2-3 years old, so take that in mind. I did not have any display at the time, because I moved my old displays to our new office at area. I got this display in a absolute bargain of 450€ as used. I wanted to have enough screen estate for dual window-workflow. I work a lot with a lot of documentation and its good to have a web site/pdf/word document on the other side and mail/word/excel on the other. Also, the screen offered 99% sRGB and 300cd brightness, which are good enough for home office environment and doesn't make it a pain to watch the display after stellar displays of MBPs. On the gaming side I did not consider anything. Everything is extra: Playing shooters is very fun with ultrawide, and racing games get also some extra feel of speed with 21:9. Civilization or Europa Universalis doesn't really get anything extra, but they're fine. I have a HDMI over RJ45 setup over to the living room, so I play all of the controller games on my TV, so no extra there either. Nowdays I'd like to get more resolution/ppi as ultrawide, but technology is not really there yet. Guess no 1-cable life for me. 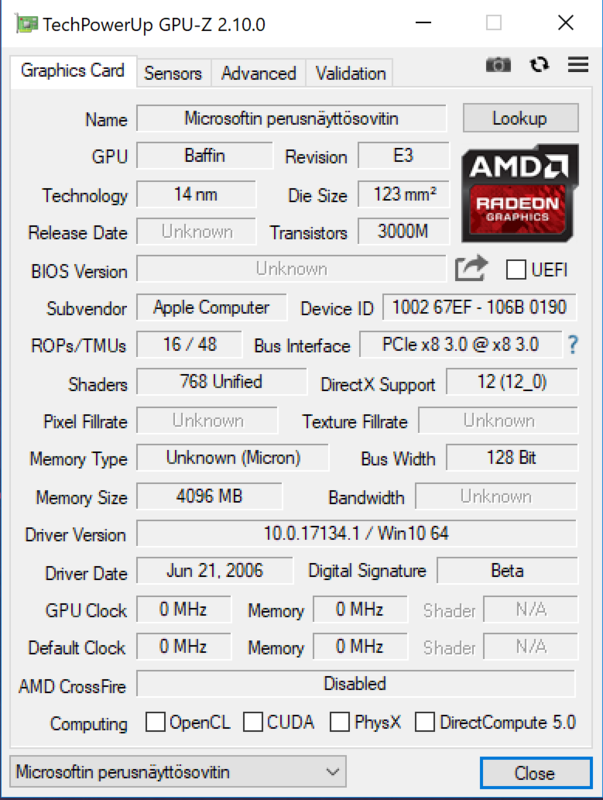 In your opinion, do you think an 8GB reference RX 480 on a base 2017 MBP 15" could push 50+ fps in 4K if internal monitor is closed, only the game is running, and the laptop is on a cooling pad? Also, after reading your guide, am I to undertake that after running this setup, the eGPU becomes plug and play in Bootcamp and macOS and doesn't require you to keep re-enabling GPUs every time you switch between OS's? Unlike the website's official Bootcamp guide? Also, why did you choose the Core X over something like the ASUS XG-Station Pro? If they were the same price or the ASUS was cheaper would you have bought the ASUS? Hey Maven. I have the same flickering dots going to black screen issue that you have with my 2018 MacBook Pro 15”. I also ran integrated.bat with administrator rights but when I boot with rEFInd I have the same issues as you. We’re able to figure this out? I really want to use my internal display to play games. I have a Razer Core x with 1080Ti FE. Thank you! Same here. I hope somebody will figure this out. This happens only after installing intel drivers. Even with dated intel drivers. However it seems that iGPU is working fine with "Microsoft basic driver". @realistic Nice build. Do you know if clamshell mode works on bootcamp with your AMD eGPU? In fact I've been clamshelling lately, when in BootCamp. With MacOS I normally put my MBP just in front of the screen and use the touchpad and MBPs keyboard. Also the latest Windows 1809 and MacOS Mojave work just fine. First boot with 1809 took one reboot to make dGPU to go in "fail -mode". I disabled the PCIe -lane for it just in case. I also noticed that the Razer TB3 -cable doesn't support USB3, I had to order a new one. @realistic Awesome. Thank you for the info. ThrottleStop changed their UI little bit, so can you retake your settings please and in more detail? I tried your configuration and I'm still getting jump in clock speeds, fans are at max. It worked for a while (5-10 min) and then it started to throttle. I have clueless in terms of how to fix this issue. that CPU tried to throttle down even with okay temperatures (from 80 degrees down).